SCHMID & GUZIK have paintings in a FINE ART GALLERY FAR, FAR AWAY… Their artworks are now orbiting Planet Earth every 93 minutes! Paintings by well-known American artists Richard Schmid and Nancy Guzik were successfully delivered to the International Space Station (ISS) on December 9 by the Cygnus spacecraft. 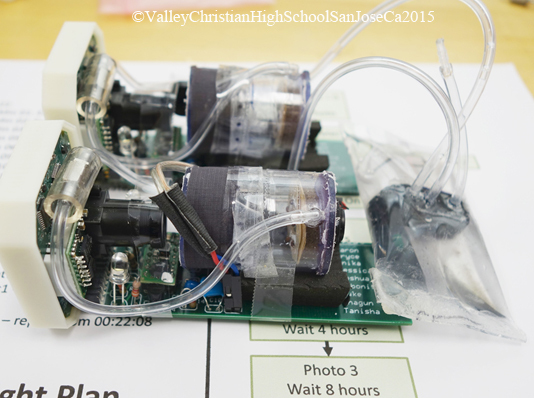 As part of a joint science/art mission which included a science experiment from students at Valley Christian High School in San Jose, CA, Richard and Nancy’s art is now orbiting the planet every 93 minutes! An earlier attempt to send their art (and that of Richard’s granddaughter, Samantha) to the ISS failed when the Falcon 9 supply rocket carrying the artwork exploded shortly before achieving orbit. Undaunted, Richard and Nancy made a new set of paintings for this successful second attempt. Although Richard’s granddaughter was unable to join in this second attempt, on December 6 the experiments and the new artworks by Nancy and Richard were successfully launched aboard an Atlas V rocket carrying Orbital Science’s Cygnus spacecraft. The Cygnus spacecraft rendezvoused with the ISS on December 9, and was pulled in by the robotic arm. The experiments, along with the art, are now orbiting Earth every 93 minutes. This art/science wonder is expected to circle the earth 330 times at a speed of 17,500 mph, at an altitude of 221 miles, for a total distance traveled of 9 million miles. If the mission is extended, it could cover as many as 25 million miles. To find out when the Orbiting Fine Art Gallery will be passing overhead (although it may just look like a slow-moving star), visit: NASA's ISS-spotting site. Richard and Nancy’s artwork, along with the student’s experiments, arriving at the ISS. The Cygnus spacecraft is about to be pulled in by the robotic arm. NANCY and her feature article in SOUTHWEST ART magazine. Nancy creating with her furry friend Zorro. The Au Coeur "Beauty in Culture Award" is given for exemplifying beauty's essential qualities and making exceptional cultural contributions. Nancy Guzik will be presented the "Beauty in Culture Award" on Friday Night, April 11, 2014 at the "Art, Beauty & Culture Event", Middleton Place, Charleston SC. 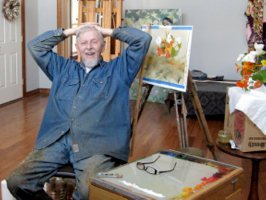 Also, join us for a celebration of Art, Beauty and Culture on April 8 - 12, 2014 with five 3-day art workshops by Kathy Anderson, Daniel Keys, Michelle Dunaway, Susan Lyon, Stephanie Birdsall, and Douglas Reichwein. SUSAN LYON "Drawing the Portrait"
KATHY ANDERSON "Gardening with a Paintbrush - Painting Flower Naturally"
MICHELLE DUNAWAY "Painting the Figure & Portrait en Plein Air"
DANIEL KEYS "Alla Prima Gardenscapes"
STEPHANIE BIRDSALL "Alla Prima in Pastel & Oil"
DOUGLAS REICHWEIN "The Alla Prima Approach to Painting Plein Air"
Congratulations Richard Schmid & Kristen Thies! You have received more than 17,000 views for your film "The Creation of a Masterwork, Abbotsford House" by Richard Schmid and produced by Kristen Thies. The Exhibition was presented by The K. T. Wiedemann Foundation, Inc. and West Wind Fine Art, LLC. Film ©West Wind Fine Art 2012. Script and paintings ©Richard Schmid 2012. 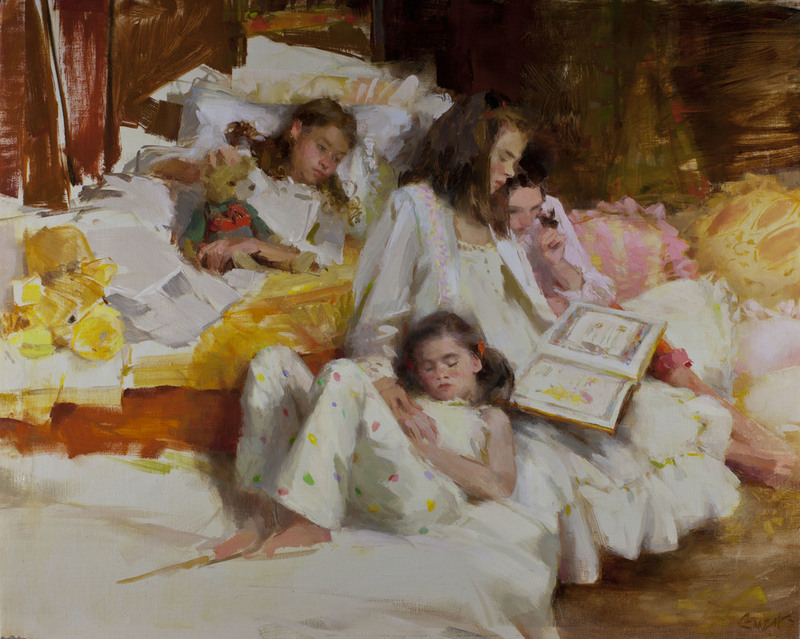 Richard Schmid retains all rights to his paintings world wide. Christmas cookie designed by our incredible model Rachel Arnold. "Wishing you all the possible wonder, joy and goodness this new year can bring." Katie Swatland and myself gift wrapping the new "ALLA PRIMA II COLLECTOR’S SERIES." * Certificate of authenticity and registration form. Congratulations Kristen Thies! Another beautiful Art Exhibition! While on a painting weekend with artists Carol Arnold and Andrea Scheidler, we painted Carol’s daughter Grace. When I found out Grace’s two sisters, Rachel and Sarah, along with friend Paige, were also coming with Grace, I thought... hmmmm. Let’s do a Pajama Party! Watch this video to get a look at the behind the scenes of how we learned that painting children from life can become a joy for all. Click below to enjoy! Coming home from Kristen Thies's Art Exhibition at Cape Cod, selling all 6 paintings, I find The First Prize in the Still Life Category is awarded to my "Spring Teacups" from The Art Renewal Center. I entered 5 artworks, one winning first, the other four paintings making it to the finalists category! Next comes the ARC Living Master's Gallery. Thank you ARC!!! Putney Painters teach at the Scottsdale Artist School! Six days of Workshops, Demonstrations, Lectures and FUN with the East Coasts leading contemporary realism group from Putney, Vermont! We are getting excited about the Putney Painter's week at the Scottsdale Artist School. My 3 day workshop is FULL, however we just posted my slideshow/lecture, "Journey of Learning & Discovery" on Friday, January 20th, 2012 & meets at 7:00-9:00pm. Cost $25.00 The whole $25.00 is donated to the Scottsdale Artist School! Win-win situation for you, myself and the school! Putney Painter's week January 16th - January 20th, 2012. This week is going to rock the universe!!! 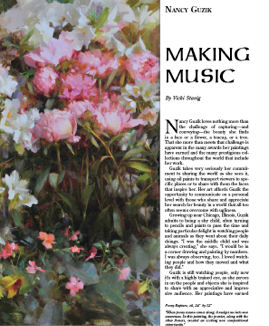 Here is my published interview with the ART of the WEST magazine titled: “Making Music”. Nancy wins Best of Show! Nancy wins Best of Show for her painting "Zachariah" 8" x 12" oil.